For the past two years, climate scientists have tracked a large and circular patch of unusually warm water off the Northeast U.S. Pacific Coast that doesn't seem to want to go away. Dubbed "the blob", it has now been linked to the strange weather recently experienced across North America. And yes, the weather has been rather odd lately. This past winter, the West coast was unusually warm and dry, while the East coast was cold an inundated with record snowfall. At the same time, animals are venturing into new areas, while hundreds of hungry sea lions — many of them pups — have been washing up on California's beaches. Now, two studies, both published in Geophysical Research Letters, has linked this unprecedented oceanic anomaly — a lingering patch of surface water that's about 2 to 7 degrees Fahrenheit (1 to 4 degrees Celsius) above normal — to this strange weather. 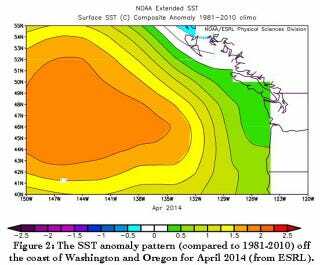 In the first study, climate scientist Nick Bond from the Joint Institute for the Study of the Atmosphere and Ocean at the University of Washington explored the blob's origins (it was Bond who first referred to the anomaly as "the blob" last June in his monthly newsletter). His team concluded that the blob — which last measured 1,000 miles (1,600 km) across and about 300 feet (90 meters) deep — relates to a persistent high-pressure ridge. This ridge is what's causing a calmer, and thus warmer ocean coast; less heat is lost to the cold air above. In addition to disrupting animal life, Bond's team learned that the blob is also influencing weather. Air that's passing over the warmer water is bringing more heat and less snow — so it's contributing, at least in part — to the drought in California, Oregon, and Washington. It was also a contributing factor to the back-to-back cold winters along the East Coast. In the second study, University of Washington atmospheric science professor Dennis Hartman analyzed the relationship to the cold 2013-14 relationship in the central and eastern United States. Rather than place the blame squarely on the Polar Vortex, Hartman showed that the North Pacific Mode — a recurring tropical pattern linked with changes in the North Pacific — is bringing warm and dry air to the West, and very cold and wet air to the central and eastern states. “Lately this mode seems to have emerged as second to the El Niño Southern Oscillation in terms of driving the long-term variability, especially over North America,” Hartmann noted in a statement. Hartmann isn't sure if the blob will stick around for a third year, but if it does, "then we'll know something really unusual is going on." Read can read both studies at Geophysical Research Letters: The Bond et al paper can be found here, and the Harmann paper here.